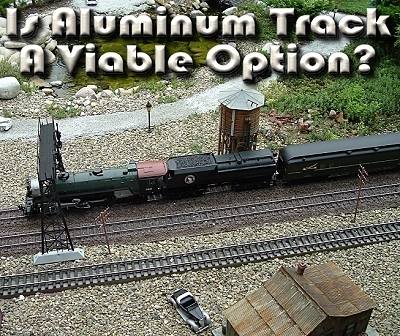 Is Aluminum Track a Viable Option? Since the advent of modern garden railroading, we have assumed that our trains would run on sturdy brass rails. In fact, LGB made their rails as large as they could be without looking silly, so that the track would be as strong as possible. (LGB rails are "Code 332" which means that they are almost 1/3" high - think "thousandths of an inch" when you see a rail's Code value.) Most other manufacturers followed suit, including AristoCraft, who used the same size rails but added screw-on track and power connections that made their track much more conductive and reliable in the long run. A few companies, such as Llagas Creek, began making track with aluminum and smaller track profiles, such as Code 250 (about 1/4" high). Many people used and liked it; some used it and weren't quite so thrilled, so it never quite caught on as it probably deserved. One factor was that the companies that could manufacture aluminum track cheaply didn't always have the resources to make turnouts (switches) cheaply, so the overall cost savings wasn't always what it should have been. Also, model railroaders and garden railroaders were used to the appearance of brass, which turned a realistic brown in a few years. Llagas Creek did offer aluminum rails that were prepainted brown, which helped, but the paint didn't always stay where it was supposed to. Still, it was a very nice look, and frankly, I like the look of Code 250 rail, but I don't always appreciate its weaker structure. Several friends who use Llagas Creek track in dry climates seem to like it. But some of my other friends experienced glitches. Aluminum Oxide Powder - One friend in the Dayton, Ohio area replaced his aluminum rails after several years with nickel silver. He runs long trains with all metal wheels - which would have kept brass track relatively clean. But apparently once the aluminum rails began oxidizing, the aluminum oxide dust generated by running trains would coat track, wheels, drivers, etc. to the extent that he couldn't run more than an hour between track cleanings. For folks who run mostly or only battery power, though, this is not a significant problem. Condensation - Aluminum draws heat from its surroundings so well that it is more prone to moisture condensing on the track in damp climates than brass or stainless, especially as the temperature drops around track that is on the ground. If your air quality is bad, the moisture will even feel a little "greasy." (Folks in dry regions never notice this problem; in fact one fellow from the American Southwest told me I was crazy for reporting it.) Some folks with small railroads in damp climates keep an old towel out to wipe off the track if it gets too wet. But some folks who run long trains have trouble with their locomotives slipping excessively on humid evenings (about the only kind we get during Ohio summers). Strength - Aluminum rail is not as strong as brass. My friend George Schreyer reminds me that if you step on aluminum rail it will bend over, even if it's on a very solid foundation. So if you use aluminum rail, it's a good idea to design your railroad in such a way that it's virtually impossible to step on the track. Not everyone has done that, unfortunately, and it is possible to lose your balance and take a mis-step, or for "helpful" friends to not pay attention . . . .
Incidentally, sometime (in the late 1990s, I think), AristoCraft offered Code 332 aluminum track as a low-cost alternative to brass, but hardly anyone was interested, because brass was still fairly reasonable in price and aluminum was considered "iffy" for track powered railroads in most of the northern and eastern parts of the country. I don't know how exactly the older Aristo aluminum track compares with the aluminum track Aristo started offering recently, because I haven't been able to try any out for myself, but some friends in Florida who run short trains on battery power love it. I do know that it did offer better rail-to-rail electrical connections than the other aluminum track brands, because of the screw-on rail joiners. In other words, the long-term results of early adoption of aluminum Code 250 track are, let's just say, uneven, and there aren't enough reported installations with AristoCraft Code 332 aluminum rails to know for sure how much better it performed longterm in borderline situations. Others downscaled or delayed their planned projects. Others began reinvestigating aluminum. Some decided to use aluminum track and invest the money they saved into converting their locomotives to battery control. Others attempted to use aluminum for track-powered railroads; not surprisingly, results were uneven. For example, folks in dry climates are still having better luck with aluminum than folks with humid climates. Not that it ever left - some of my friends with Llagas Creek track have been virtually unaffected by the whole track price jump thing. But about the same time AristoCraft realized they were going to have to kick up the price of their brass track, they announced that they were going to be reintroducing aluminum track, in at least a few formats. 4'-diameter curves (compatible size-wise with LGB R1, the radius that comes with most Large Scale train sets) - These were initially available only in boxes of 48, though some dealers split them out, and boxes of 12 were slated to follow in a few months. 1' straights (about the same length as R1 curves). Again, these were initially available only in boxes of 48, though some dealers split them out, and boxes of 12 were slated to follow in a few months. Several more have been announced but I haven't been able to find them in stock anywhere. Consider investing in a track cleaning car to get any aluminum oxide dust or condensation "film" off the track at the beginning of each session. You can use aluminum, brass, and stainless steel track on the same railroad. If you're using a lot of turnouts in one part of the railroad, you may want to use brass or stainless steel, since more turnouts, crossovers, etc., are currently available. But for mainline sections with few turnouts, aluminum will save you serious money over brass. If you're running battery power, there's very little reason to spend the extra money for brass or stainless. AristoCraft sells special rail joiners to reduce corrosion at junctions between aluminum and other rail materials. Aluminum is not as sturdy as brass, although AristoCraft aluminum Code 332 track is sturdier than most aluminum track, because it uses heavier rail. Still, you should consider a very solid roadbed construction, especially if you use Code 250 rail, which has a smaller profile. Some examples of solid roadbed construction include our Simple Raised Railroad or HDPE Flexible Roadbed solutions. Because aluminum and brass are slightly different in conductivity, metal wheels on your rolling stock will sometimes seem to "arc" slightly as they go over transitions between the two types of track. This also sometimes leaves a little dark mark on your wheel. These marks usually wipe off when you're cleaning the wheels, and haven't been a problem for anyone I know. To see a list of Code 322 aluminum track that we are fairly sure that AristoCraft is offering or will offer soon, please check out the Solid Aluminum Track section of our "Track Order Form" page. You may have to draw your own - I admit that most of my examples of what worked and didn't work about aluminum track are "anecdotal," and your situation will be different. If I was building a railroad this year, especially if I lived in a drier climate, I'd consider starting with a loop or two of aluminum track just to see how it fares for me. If you are planning on using mostly or all battery-powered locomotives, that would be another point in aluminum's favor. On the other hand, if you live someplace with humid summers (like Dayton or Pittsburg), you plan on using track power, and you want the lowest maintenance track available, you might want to consider stainless steel, even if it means a smaller railroad at first. Me, I have enough Aristo brass track left over from what I bought to put on last year's clinics that I don't need to think about it for a while. Now if I had just bought enough gasoline last year to last me until now, I'd REALLY be in good shape. Please contact me with any feedback, corrections, additions, and/or personal abuse that you feel this article warrants, and I'll publish the bits that seem useful to our readers. I've been using Llagas Creek code 250 aluminum with track power since the beginning (2001). Because it's code 250 and aluminum, it's not as robust at 332 brass, but it cuts easier. Aluminum is the second best conductor of electricity next to copper. Because of its light weight, it is often used in aircraft. It does need to be cleaned, but I've run trains for four hours or more before that became a problem. With a track cleaning caboose, that problem ended. The solution to electrolysis is simple (now)! I've used Hillman Clamps since I put the track down, and the brass and aluminum did cause problems. I now put heavy gauge aluminum foil around the rail and tighten the clamp. Electricity, being lazy, never goes into the brass. I've also used some of Hillman's stainless clamps. They seem to work fine. I have some Sunset Valley aluminum track, and while others have reported problems with the ties breaking off the rail, I haven't. It mates with Llagas Creek, and looks fine. I recommend aluminum because it's cheap, the smaller size looks great, and mine works fine. I live in Sacramento, CA, and get a foot of rain a year. The summer heat does not cause ME any kinking problems because much of the rr in in shade, and I've got very little absolutely straight track. Minimum radius is five feet, but use long gentle curves around the rest of the layout. On type of rail used, I have been using Peco Code 250 Nickel silver track indoors for some years with no problems (using DCC). I tried some of their aluminum rail track but contact was so poor, I am replacing this with NS and using the aluminum rail for guard rails . . . .
Garden Train Store(tm) is a participant in the Amazon Services LLC Associates Program, an affiliate advertising program designed to provide a means for sites to earn advertising fees by advertising and linking to amazon.com.